By the time we hit age 25, we have accumulated a lot of… well, “stuff”… in our psyches. Some of it is good, like encouragement and love. Other things are rather stinky… such as hurts, lies, and abuse. But every gardener knows that when starting a garden, a good compost is of real value. Arguably, the best compost begins with garbage! Many of us ages 40 to 50 become aware that in addition to the gradual disintegration of our bodies, the “trash” from our past – stuffed away throughout our lives – is decomposing in our psyches. Issues that weren’t addressed very well in our earlier years could start to smell… and those around us may begin to notice that we simply are not ourselves. They start to see signs of “mid-life crisis” as we struggle to reconcile the perceived “mess” our lives have become with the hopes and dreams that kept us inspired in earlier years. When difficulties of deterioration begin to rise, it is important to step back and examine the “compost pile” of our accumulated experiences. We must search to find ways of airing things out and letting them blend more naturally, so that the results can be used as a healthy fertilizer for the second half of our short growing season. DISCLAIMER: I am not a doctor, a therapist, or even a gardener! What I am about to write is my own view based on my own personal experiences. 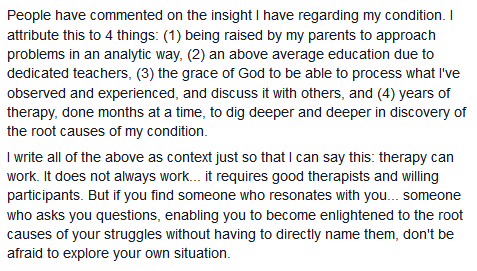 Maybe some of it will be helpful to others, but if you’re already in therapy (or about to start), don’t derail your own progress by choosing my advice against the professionals’! Before we explore the “composting” analogy of psychological therapy, here’s a little note to loved ones: counseling can often be a good thing, but much like recovery from drug dependence, it is most effective when the person is ready to receive help. Forcing advice on someone can be a mistake. When a person is not receptive to good counsel, attempted assistance adds “garbage” to the pile. While this could eventually prove beneficial, in the short term it is just as likely to hinder progress and slow maturation. Too big… too little… just right! There are so many options for therapy, from blogging, sculpture, or sports, to intensive psychoanalysis. 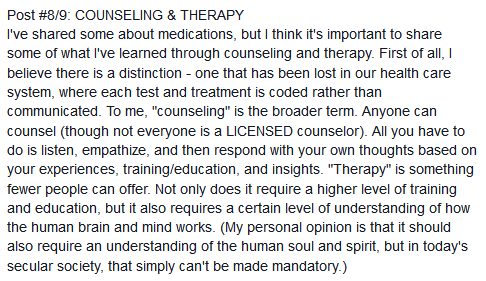 Part of the process of enjoying an effective therapy experience is to determine which level is right for you. In my experience, it is best to find something that is right on the edge of your comfort level – something that will push you to make positive changes and won’t shove you deeper into your issues. Leave the lid cracked. Just as composting works by letting nature take its course, the best therapy seems to be that which comes out of a natural expression of emotion or concern. If art works for you, great… but if you’re not at a point of being willing to express yourself in an open or public way, private therapy or drug therapy may be the best thing for you until you have a higher comfort level with cracking open the painful or oppressive areas of your life. Choose sun or shade. Perhaps what’s most important is to find a counselor with whom you feel comfortable – someone who seems sensitive to your issues, respectful of your experience, and who offers suggestions that align with your personal goals and dreams as you are able to express them. But don’t be too quick to dismiss a counselor – if you’re hearing suggestions that do not seem to make sense, ask the counselor why they are making that particular recommendation. Often you will learn as much from their reasoning as you will from the recommendation itself! Remember: Layering is key! As you enter into therapy, your counselor may ask you questions about your past. If there are areas in your life that seem too painful or too embarrassing for you to share, simply say so. A good therapist will note these areas for exploration later, after your healing has progressed to the point where they are no longer so uncomfortable. As therapy progresses, if you do not find that your counselor is helping you to progress through those layers of trash and waste, don’t be afraid to challenge your therapist a little – it could be that they are just waiting for you to be strong enough to insist on a stronger approach! Include the “green” stuff: leaves, vegetables, grass, kitchen garbage. In “composting the psyche”, the “organic waste” of our lives is the stuff we are born with – such as hereditary issues, or the health conditions of our mothers and fathers. Include the “brown” stuff: twigs, dead leaves, soil. 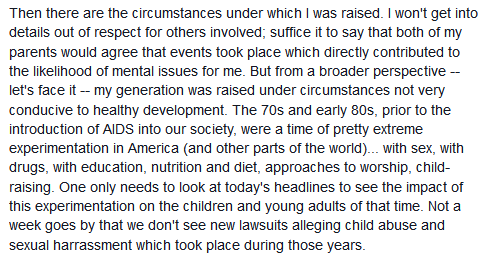 In addition to genetic predisposition, I firmly believe that the circumstances of our birth have a significant impact as well. A “wanted” baby will not have the same issues as an “unexpected” or “unwanted” one. A child delivered naturally is not going to have the same kinds of issues as one delivered by surgery, or one conceived in a petri dish, or one that was damaged as delivery was taking place. Can I prove this? No… not as yet – maybe it would be a good doctoral thesis for someone! I do think this idea will ring true among professionals as these factors begin to be considered. Avoid meats. When sharing memories, emotions, or ideas with your counselor, try to stay focused on the events which seem as though they did damage to your soul or spirit, either by injuring you or by holding you back. If you have vivid memories of a particular moment in your life, don’t wait until you are in the therapist’s office to start exploring those a bit. Spend a little time with each one, and decide whether it makes you feel safe or threatened, empowered or diminished. Take the negative moments back to your therapist, explain them briefly, and then just listen or answer questions asked. If you are paying for time, investing a few minutes like this ahead of each session will help you progress much faster. Let the layers pile up. As life progresses, hurts and abuses take a toll on a weakened psyche. Some abuses can bring even a perfectly healthy child into a state of shock, panic, fear, or denial. Parents who have raised their children responsibly must not blame themselves for these events, no matter how traumatic they are – they are just a part of life as we know it. Similarly, we must not find fault with ourselves… mistakes happen, and even adults frequently do things that are not in the best interests of others, sometimes deliberately but more often because of unhealed wounds in their own past. Alternate “green” and “brown” layers – “reeling in the years.” Personally, I find it best to work backwards, identifying recent painful or oppressive memories first, and then for each memory trying to tie it back to what I know about family history or the circumstances of my birth. For example, just before my last semi-serious psychotic break, the temperature outside had become notably cold, and the harsh winter conditions were lasting longer than usual. Understanding that the side of my family suffering most from mental illness is of primarily Scandinavian descent, I have considered that these specific conditions may have helped trigger feelings of being oppressed by my illness, followed by surreal thoughts geared toward finding ways to explain or escape it. Turn the compost periodically – “stowing away the time.” Just as stirring up a compost pile by turning it with a pitchfork allows more air into the mixture so bacteria can do its job, ignoring the constraints of time can help you make associations that might otherwise be overlooked. For example, I remember that one of my first conscious feelings of being oppressed was when I joined a swim team after moving to a new state. This could help explain why I now have an aversion to water, when previously I swam like a fish. Balance the water content – “gathering up the tears.” It is recommended that a compost pile be “about as damp as a sponge that has been wrung out.” Don’t try to hold back tears that come up during therapy – think of them as extra water in the pile that has to be removed. Too much water in a compost pile prevents the air from getting in – which in turn causes the pile to rot instead of decomposing at a natural rate. I suspect men generally find releasing the waterworks more challenging than women do – not being in the practice of giving into emotion. That, in and of itself, is a form of oppression because crying is a normal and sometimes necessary thing to do in the human experience. Each year that passes, we experience loss, whether simply of time or of other significant dimensions of our being… and grieving the loss is to be expected. I think this step is probably easier for parents than for single folks like me. One therapist explained it to me like this: psychotherapy is like grieving the child that you were. As adults, we can step in and “parent” the child in the best ways we know how, just as our parents did, but under different circumstances. For myself, this was very difficult. Trying to imagine being a good parent to the child that had been me only brought me more sadness for her suffering. But admitting this to someone I trusted helped me move past that hurdle. Before long, I found that the application of parenting skills (as they are now understood) uplifted and healed the child rather than causing her feelings of oppression or pain. By far the most healing circumstances are those where you can take what you have learned from life experiences and apply them to help someone else grow. Parents do this naturally for their children and grandchildren – they say the best fertilizer is at the bottom of the pile. Folks like me have to find alternate ways – such as this blog, or interactions online – to take the real lessons we have learned through recovery and allow them to be accessible to others. The ideal situation in life is to find a vocation in an uplifting and healing environment where there are frequent opportunities to recycle “trash” into “compost”… allowing the “rocks” of your earlier years to become fragrant “roses” in your present days – not only for your own well being, but for others as well. Before ending this article, I feel compelled to share one more observation: just as a compost pile matures best with rain and sunshine, so a human life develops best with prayer and grace. The “Twelve Steps” of AA suggest that we consider God our “Higher Power,” whoever or whatever that may mean – something or someone greater than ourselves. While I strongly believe that knowing God through Jesus Christ, His Son and our Savior, is by far the best, I also agree that simple acknowledgement of factors in our lives greater than we can face alone does wonders toward growth and development. Asking others to remember us in their thoughts and prayers as we enter a period of counseling or therapy engages their love for us and employs their intentions of good will… and I believe God will always honor this kind of prayer.